I began studying Herbalism in 2008 (if you don't count all those nature walks at Girl Scout camp as a kid), and will likely spend the rest of my life just keeping up with everything that plants have to teach us. The more I learn, the more there is to know. One thing I can verify, though: plants have so much to give, it's time they were treated with more respect. I have completed the Clinical Program (2nd year) and additional focused study in Five Element theory at the BotanoLogos School of Herbal Studies, based in Northeast Georgia, and am enrolled in the East-West School of Planetary Herbology, based in Santa Cruz, California. My goal is to incorporate the wisdom of herbs into the work I do with Reiki, Reflexology and Jin Shin Jyutsu, and to become a Registered Herbalist. In order to qualify for Registered Herbalist status under the national accreditation organization, the American Herbaiists Guild (AHG), I need to complete both the requisite classroom hours and clinical practice hours before taking the qualifying exam. To that end I am offering Clinical Herbalism Assessments for a nominal fee. All clients will have an initial intake meeting, then their case histories reviewed anonymously by my AHG mentor and a peer review board, and they will be presented with a set of recommendations that may encompass herbal formulas, lifestyle, exercise and dietary suggestions. Further follow-up (by email or phone) may result in adjustments to the assessment plan. For more information or to schedule a Clinical Herbalism intake appointment, call/text 404-406-5204 or email reikidancing@gmail.com. What's Growing on Black Rock Mountain? Here's a slideshow from a Georgia Forest Watch Plant Walk. Look for spring ephemerals like Bloodroot (Sanguinaria canadensis) to begin blooming usually in late March in the Southern Appalachians and piedmont. These delicate blossoms rarely last more than 3 weeks; at the first sign of heat they fade, replaced by the distinctive "puzzle piece" palmate leaf. © Maureen 'Moe' Cairns. Used by permission. 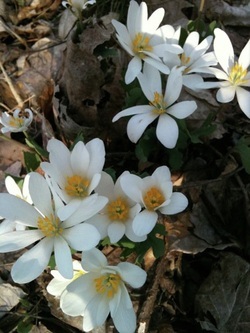 Bloodroot is a powerful botanical - even a small amount of the root can have a profound effect. Herbalists use it in tincture form to address lung congestion and coughs, often combined with other, more demulcent (moistening) herbs such as mullein (Verbascum thapsus), plantain (Plantago spp.) or coltsfoot (Tussilago farfara). Bloodroot is considered a stimulating expectorant, anti-spasmodic, anti-inflammatory, cathartic and emetic. It is also a topical irritant so handle the roots with care! To find out more about Patricia Kyritsi Howell's BotanoLogos School of Herbal Studies, please visit www.wildhealingherbs.com. 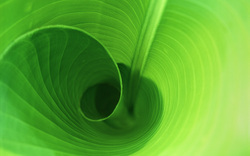 For more information about the East-West School of Planetary Herbology, please see www.planetherbs.com. Information on workshops with the Aromatherapy School can be found at www.aromatherapy-school.com. The American Herbalists Guild website is www.americanherbalistsguild.com.